ChIP-exo is well-suited for mapping at ultra-high resolution, where a protein binds across a genome. It is a modification of ChIP-seq, whereby lambda exonuclease is used to eliminate DNA fragmentation heterogeneity, resulting in ~100-fold better resolution. 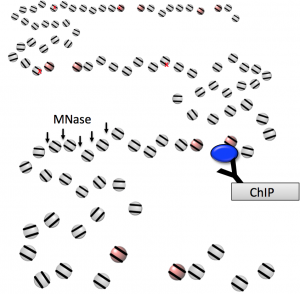 MNase ChIP-seq provides an ultra-high resolution method to map nucleosome positions across a genome. MNase hydrolyses linker DNA between nucleosomes, leaving relatively precise demarcation of nucleosome edges. While other nucleosome-mapping assays claim to be better, they tend to be technically difficult with little improvement over MNase-based assays. Permanganate reacts with “T” nucleotides in unpaired bases, allowing regions of “open” DNA to be mapped across a genome. 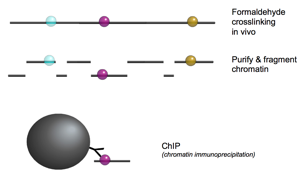 PIP-seq couples this permanganate reactivity with ChIP and deep sequencing to identify “open” Pol II pre-initiation complexes and paused complexes across a genome. ChIP-exo is an involved process that may be difficult and expensive for a typical academic lab to set up. Peconic, LLC offers a commercial service for the ChIP-exo assay that includes experimental design, sample crosslinking, chromatin prep, ChIP, exo library construction, deep sequencing, data analysis, and data management in a single. B.F.Pugh has a financial interest in Peconic.